Through my food blog, I have not only been able to explore my own regional cuisine (Andhra), but have been fortunate to explore a myriad of regional cuisines. India has a vast repertoire of extraordinary traditional culinary gems that are slowly disappearing. Our traditional culinary traditions are being lost as the older generations pass away. I have deep love and respect for regional Indian cuisines, meals prepared with fresh ingredients that embody simplicity and humility, cooked and served with love. To learn and share about regional food culture, traditional home style recipes and cooking techniques, I had embarked on the Indian Food Trial journey in 2008. Not only did I learn about different food cultures, I even cooked and tasted new flavors. Indian Food Trail covered different regional cuisines of India where fellow food bloggers shared their insight into regional cuisines, traditional everyday recipes doted with sublime food experiences. Listed below are guest posts on different Indian regional cuisines by fellow bloggers. Today, she shares with us an in depth article on Mangalorean Cuisine. Here’s the first post of her 3 part series on Mangalore food culture. Thank you, Shireen, for taking time to write a wonderful article on your home cuisine. Dear readers, please give a warm welcome to Shireen Sequeira. Mangalore, the coastal town of South Karnataka is situated where the river Nethravathi meets the Arabian Sea. This ‘meeting point’ or ‘Koodala’, as it is called in Kannada (one of the local languages of Mangalore) is believed to be the reason why Mangalore is also known as ‘Kudla’ amongst the local people. 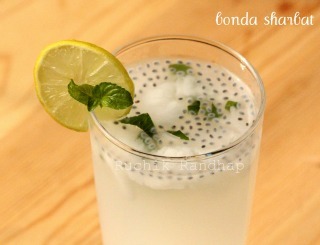 ‘Kodial’ is another local variation of the same name. Every Mangalorean is proud to be associated with one of India’s most beautiful coastal places. The virgin beaches and coconut groves easily remind one of Goa and Kerala – well Mangalore is similar because it lies along the same coast as these two States and has been bestowed abundantly with nature’s bounty. Those who come to Mangalore instantly fall in love with this place and adapt themselves to it in many ways, taking back with them its rich culture, heritage and cuisine. Mangalore can be rightly described as the pot pourri of cultures and languages due to the influence of many communities that include the Tulu speaking Bunt & non Bunts, Konkani speaking GSBs (Gowda Saraswath Brahmins), non GSBs and Catholics, Kannada speaking Brahmins, non-Brahmins & Protestants and Beary Bhashe speaking Muslims. Hence Mangalorean food is rich with the contributions and influence of each of these cultures. The myriad flavours, cooking techniques and ingredients that are part of Mangalorean cuisine makes it rich, varied & truly a class apart. One can never get bored of eating food in Mangalore as there is so much to explore and savour. The different flavours of Mangalore food is what I aim to showcase in this post. Each of the communities mentioned above have their own style of cooking – the flavours are distinctly different yet similar in many ways. For example, many seasonal delicacies that are prepared across homes tend to use the same ingredients and cooking techniques but may slightly vary in appearance and taste. Pathrade or Pathrode is one such delicacy that is traditionally prepared during the monsoon season. Made of colocasia (arbi) leaves, rice batter & spices, Pathrade involves steaming before it is cooked in a coconut based curry or smeared with masala paste and shallow fried. Now the technique behind making the Pathrade differs between communities. While the Catholics shred the colocasia leaves and mix it with the rice batter and then steam it in leaf packets, Hindus make it by smearing the ground masala paste between a cascade of colocasia leaves and then rolling this before steaming. The roll is then cut into roundels (slices) and cooked in a gravy or fried. 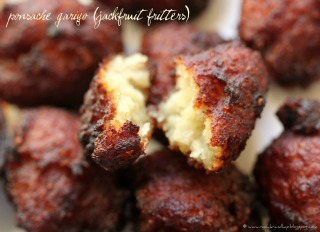 Similarly other seasonal delicacies such as the Turmeric Leaf Patholi (Rice dumplings with a sweet filling of jaggery & coconut steamed in Turmeric leaves), Jackfruit Patholi (Steamed Jackfrui & rice batter cakes), Jackfruit Gariyo/Garige/Mulik (Jackfruit & rice batter fritters) Kottige/Khotto (Idli batter steamed in Jackfruit leaves) are some common delicacies across sub cuisines with just a slight variation in cooking technique and flavour. Mangalorean recipes are largely synonymous with the Bunt cuisine as the Bunts have been pioneers in the hotel/restaurant business since decades. They have also been instrumental in giving the Masala Dosa the fame that it richly deserves and also brought the Neer Dosa and Kori Rotti to the forefront among the other Mangalorean food varieties. I have a special liking for spicy food that is the USP of Bunt style cuisine. 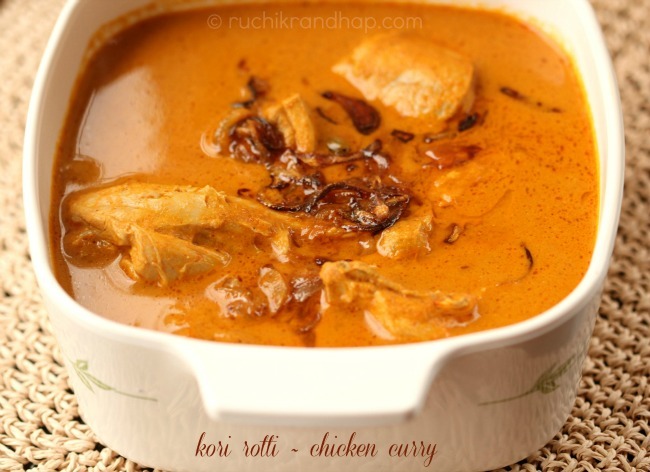 Here’s the Mangalore recipe of chicken curry for Kori Rotti for you – it’s my all time favourite spicy Kori (chicken) curry that is eaten with Rotti – wafer thin rice crepes that are dried and very crispy. While I doubt many people would still make it at home these days, it is manufactured at the industrial level and is available with most grocers in Mangalore or at ‘Mangalore Stores’ outlets in Bangalore & Mumbai. Enjoy the recipe! 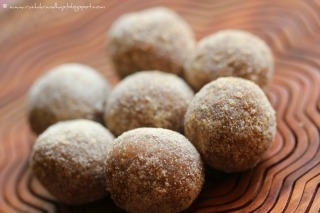 I will be back with a popular sweet dish along with the second part of the article on Mangalorean cuisine soon. Cut the chicken into medium sized pieces, wash and allow to drain on a colander. Next fry the onion and garlic and remove and add the coconut, turmeric powder and tamarind to the same pan, roast and remove. Grind all the roasted ingredients to a fine paste using a little water. Reserve the masala water. In the same pan add the ground masala and the sliced onion. Mix and add the thin coconut milk. Leave the pan uncovered & bring the curry to a boil, add the chicken pieces and salt to taste. Cover the pan now and cook the chicken till tender on a medium flame. When the chicken is cooked, simmer and add the thick coconut milk and bring it to boil for just a couple of seconds. Turn off the flame. In a smaller pan, heat the ghee for seasoning and toss in the cinnamon, cloves, cardamom pod and the sliced onion, fry till golden brown and add this to the curry. Cover the pan immediately to trap the aroma of the seasoning. 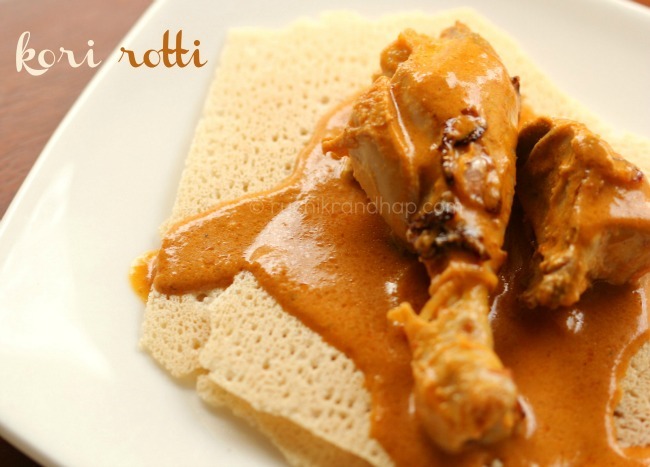 Serve hot with crispy rice Rotti - let the curry soak up the rotti a bit before you eat it. 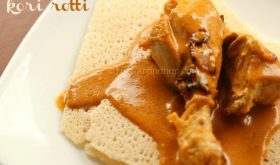 Alternatively, you can serve the curry with rice, pan polay (neer dosa), appams, sanna, mutlim (rice dumplings), polay (dosa) or chapathi. 1. A large coconut yields approximately 2 cups thin milk & 1 cup thick milk. Here's how to do it & the substitute for it. If you do not wish to use coconut milk in your curry just use 1-1/4 cups of grated coconut instead of 1/2 cup and skip the coconut milk altogether. But you may need to adjust the spice a bit here. 2. Mangaloreans, especially Bunts use short red chillies which are also called as Harekala chillies - these are quite spicy. The long dry chillies that are used are called the Byadge/Bedgi chillies. You may use a combination of both or just use the Bedgi variety. To reduce the spice adjust the quantity of peppercorns and use the chillies partially deseeded. For a mildly spicy curry you can use Kashmiri chillies. The original recipe asked for 22 chillies & 1 tsp peppercorns. I reduced them to 15 chillies and 1/2 tsp peppercorns which yielded a medium spicy curry. A lot of the spice gets balanced out when the coconut milk is added, so please use your judgement here. 3.While roasting the spices take care to ensure that they don't burn or turn black - this will lend a bitter taste to the curry which is avoidable. Ensure that roasting is done in a good quality heavy pan. By Sailu Published: August 28, 2012 Indian food trail (second edition) kick starts with Mangalore food culture. Shireen shares her insight into Mangalorean cuisine and a few Mangalore recipes. Thank you so much Sailaja for hosting this series and inviting me to your most esteemed blog to do a guest post. It is such a pleasure and I am happy to share all about Mangalorean cuisine with you & your readers! You are most welcome, Shireen. The pleasure is all mine. Thank you for an absolutely wonderful insight into Mangalore food traditions. Interesting blog – I like it. Thanks for visiting mine. Sailu, am a huge fan of your blog and have been following it since a very long time. I liked the regional cuisine series you started and its nice that you have re-started it again. I found Shaheen’s blog via those posts and am a huge fan of her blog too. 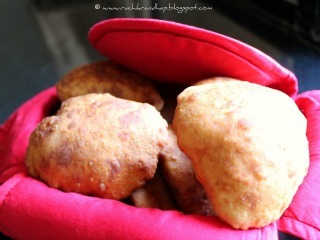 Shireen, thanks for sharing a well written article and enlightening us on Mangalore food. I love to know about different foods across the country and am amazed to learn of so many similarities with subtle differences in cooking styles among regional cuisines. Sailu, Thanks for posting Shireen’s entries. It is generous of you. I’m a Konkani who hails from the Mangalore area (am currently far, far away), and Shireen’s posts bring back wonderful memories of Mangalorean food. Shireen, thanks for your passion for cooking and posting these delicacies. I share your passion for our regional foods. I plan to return to your blog at leisure and explore! 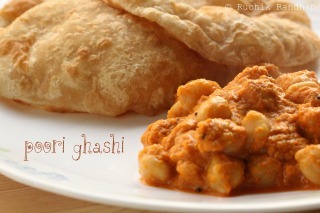 Sailu, Thank you for posting Shireen’s recipes. It is generous of you. I’m a Konkani who hails from the Mangalore area (am currently far, far away), and Shireen’s recipes brought back wonderful memories of Mangalorean food. Shireen, thanks for your passion for cooking and posting these recipes. I share your passion for our regional food. I plan to return to your blog at leisure and explore! blog at leisure and explore! Hi Sailaja, I am mangalorean too and i love Kori rotti.. thanks for the recipe… I am quite new in blogging and have learnt a lot from u guys.. Chk it if u get time.. http://shweysfoodjourney.blogspot.in/.. Cheers!!! Love Shireen’s Blog. Great post Shireen. Thank u for this wonderful recipes. I’m mangalorean I love all this recipes. 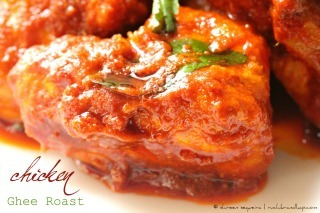 Chicken ghee roast is one of my favourite recipe.